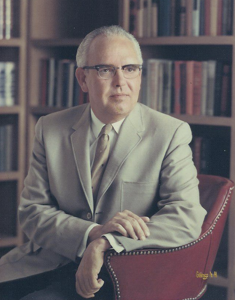 Bertram Bruce, my father, opened Bruce Piano Company around 1950 in Fort Worth. The store later became the authorized Steinway dealer for Fort Worth and provided pianos for performers visiting the Fort Worth Symphony and Opera. We occasionally got to meet those performers in our home. I worked in the West Lancaster store in the summer when I was 15. I remember learning how to buff hammers, replace bridle straps and damper felts, install new hammer shanks, glue on new plastic key surfaces, and generally, restore most other parts of the piano action. I also helped with refinishing, including converting old uprights into mirror spinets. This was mostly on old uprights, some of which were in sad shape after years of abuse in a bar or humid basement. Many of the operations were challenging at first, but even I could learn them after 88 times. In the beginning, the store focused on pianos, but later began selling televisions. That led to several robberies in which mostly the new TVs were stolen. This proved to be a great hardship on the small business. The original location was on Fifth and Calhoun St., in the Binyon O’Keefe Moving Company warehouse. Later the store moved to 8th Avenue near Massey’s, then to the Westchester House where it doubled the space. After that it moved to West Lancaster near Farrington Field. My mother made curtains for the first store and played a crucial role in many other ways to help the young store thrive. 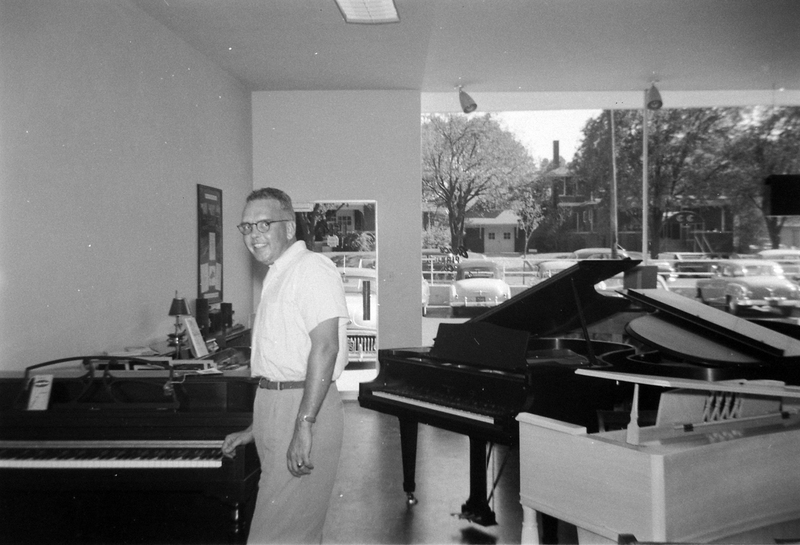 Later, Bruce Piano Co. opened a second store on Pipeline Road in Hurst, with Ken Nance as manager. Harvey MacDougall became the manager of the main store. The final location was on Inwood, off of Camp Bowie Boulevard. Bert then invited his brother Don to merge his business. I remember Don as being an excellent salesman, but like many good sellers, he was an overly willing buyer, too. Rather than insisting on the cash that the store needed, he’d make trades for a boat, a pool table, and once, a donkey. My father had to rein him in from ordering a truckload of the latest amp or band instrument. All of this happened shortly before my Dad died on December 12, 1969. Don bought the store after my Dad died and then Harvey took over after Don died. Don, who was two years younger than Bert, also died at age 54, just two years later. Later Harvey bought Bruce Piano Co.
Bruce Piano Co. was a well-known part of Fort Worth for 35 years, offering everything from used and low-cost new pianos for families who wanted their children to learn music to Steinways for visiting performers. There were also practice rooms used by local piano teachers. Over the years it also sold sheet music, organs, guitars, band instruments, speakers and amps, televisions, and even once conducted an ill-advised experiment in bagpipes. But changing habits among the public, with the rise of television and music recording devices, meant that piano sales were less and less a central part of middle-class family life. When the Savings and Loan crisis hit in the 1980’s the bank cut off credit for floor planning and the company could no longer survive. This is a sad story, but I’m proud of what my father accomplished (with ample help from my mother, Don, and others). I’ve also become more aware of what the store did for the community over many years. There’s a piano in our home with a decal showing that it was once on the floor of Bruce Piano Co. I try to play a little each day, and imagine the others whose lives were also enriched by what the store did. This entry was posted in Cape Cod and tagged life, music, personal, Texas. Bookmark the permalink. I used to hang out at the Pipeline Rd location and also drive Ken crazy I’m sure. He was always nice and offered great advice to an annoying teenager. My parents bought me a Custom Les Paul for Christmas from there in 1980. I’ve played shows all my life all over DFW and Austin and owe a lot to the store and staff for enriching my life with music. Thank you! Thanks for the post. I think we’re building up here an interesting history of music in Fort Worth, not just about Bruce Music. I remember Travis very well. He seemed like a fine man, as well as a universally respected piano tuner. My grandfather Travis Burgett (who was blind) was the piano tuner for Bruce Piano Co. Does anybody remember that? The reminiscences of former Bruce employees have all been delightful, showing great affection for the company, the boss(es), the fellow employees, the many musicians who came through. I checked eBay for STOLEN FROM BRUCE picks and didn’t find any, although there are listings for many other guitar picks with various names and businesses. Collector’s item! Thanks to all former Bruce contributors for a good read. You, too, Chip. Those were the days, eh? I purchased my first piece of gear, a Vox wahwah, from Don Bruce in about 1965. That was the beginning of my association with the Bruce legacy. I went to work for Harvey McDougal at the Hurst store in 1969, while still in high school he was my second dad for a long time to come. I left when I went to college, only to come back to work for Harvey when he went to the Indale store, to begin the buyout. I got to know Don, and Nancy quite well. She was a wonderful, sophisticated lady. I was the “combo “ manager for Harvey for 12 years. It was a great store back then. Dale Drake selling pianos on one side, and the rest of the crew making noise on the other side. All of the people that worked there, and our customers, made it a great place to work. Terry, JB, Bill, Mark, Jeff made everyone feel comfortable. We had everyone from Van Cliburn, to Stevie Ray and Jimmie Vaughn, Bob Wills, Leon Rauch, Ray Price, David Allan Coe,Delbert McClinton, Stephen Briton, Bo Didley, Lewis Stephens, Bill and Warren Ham, and many many others come into our store. It was like a big family. Chip, your dad and his family started a legacy, that is still talked about to this day by musicians all over the United States. FYI, the “STOLEN FROM BRUCE” pick was a promotion that we came up with to sell and or give away, in the mid to late 70’s. Those picks and Bruce Music shirts are still cherished. What a great place to work. Thanks, David. It sounds like you’ve had a great career and it makes me happy to know that Bruce Music played a part. Wow! I hung out at Bruce Music on Pipeline Rd ALL THE TIME when I was in high school. I had a very cheap horrible guitar, and I’d spend hours in there playing the Gibson and Guild acoustics. The first Les Paul I ever laid my hands on was a Bruce Music. I actually eventually bought a few guitars (an Alvarez Yairi dreadnaught, an Alvarez Yairi classical, and an Electra clone of a 335, along with a Peavey amp). I think I drove Ken Nance crazy. I remember him telling me he was going to charge me for strings because I was wearing out the stings on the store’s guitars. But Ken was always patient and good natured. I recall another employee at that store named Jack Daniels. And I took a few lessons from Wilbur Savidge who had done a record with Chet Atkins. Wilbur took me to see Chet play at the Paladium in Dallas. Pretty cool for a guy his age to take a teenager to see Chet. I still know the arrangements he taught me. I also participated in the infamous 1976 Pick-A-Thon, coming in 3rd place after 88 non-stop hours of playing (in the parking lot – in Texas – in August) and winning a whopping $50 (do the math on my $ per hour). Great memories. I ended up being a professional musician for many years, studied guitar at North Texas, played thousands of gigs, played for the President and some other interesting events. I still play all the time now. Bruce Music was definitely a major part of my personal music history. Thanks for making that store exist! It certainly played a big role in at least one musician’s life. Gary’s right about the Bruce Piano Co. in Fort Worth, and also his tips for tracking down information on your piano. There was also a Bruce store in Springfield, Illinois, owned by my great-grandfather. That store sold pianos and kitchen appliances. Hello Jenny. Unfortunately that Bruce Piano Company is a different family and business than Bruce Piano Service or Bruce Musical Services or Bruce Music in Edmond, OK. As far as I know we are no relation except through piano relations. There is no information that I found in my piano resource materials that indicates that Bruce Piano in Ft. Worth was a manufacturer, just a dealer as others have posted on this blog. Many dealers had decals made and placed on the pianos they sold. It’s likely the piano was a “stencil” or has a name on the cast iron plate with a serial # that could be traced. The Pierce Piano Atlas is the Bible of manufacturer information including serial #s and dates. Chip, this was a great read. Loved the comments from DJ 6-24-2014, also Ron Banks’ story. All very touching and rich in humor. Thanks for sharing that. It makes us happy that the store made a difference. I doubt that music store owners really know how dramatically they affect people’s lives. I always dreamed of becoming a musician. My first “serious” guitar came from Bruce Piano around 1971. It was a special order Gibson ES-340TDN. That guitar later played music for the Opollo Astronauts, opened for several Opry stars, put my kids thru private school, and provided solace countless times when it really mattered. You never forget your first guitar. Bruce Piano made a difference in my life that lingers to this day. My dreams came true as I’m sure they did for many of your customers. I have a stolen from bruce guitar pick, any ideas? I’m sorry I can’t help much. Bruce Piano Co. was a retail store, not a manufacturer. I hope you can learn more about the piano. Hello, I found your blog while researching information on a piano that I recently acquired. It was my grandmothers piano and after she passed I acquired it and have been avidly looking form ore information on this instrument. It has a bruce and company logo stamped on the front of the key cover and the inside states bush and gerts. The serial number on the bush and gerts interior is 56484 which from my research states that it was made between 1915 and 1920. I am wondering is this a piano that was manufactured by bush and gerts and then sold by bruce and co? I am bewildered at this point. Did Bruce and co. build pianos with bush and gerts parts? Any information would be helpful in helping me better establish whether or not it is worth it to restore. Thank you for your time. I found your BLOG entry on BPC/BMC quite by accident doing a Google search for Ken Nance. I remember going to the store on Lancaster to buy guitar strings and drum sticks when I played in a rock band in high school, about 1966/67. Later I worked at the Indale Rd. location from 1976 to 1987 as the service dept. manager. . . repaired guitars and electronics, installed sound systems, and handed out lots of free advice. I have many photos from those days and lots of great memories of working in a music store. There is nothing like working retail to test your patience, or get a good laugh. . . the stories we all can tell. . . you just can’t make this stuff up! The old Bruce Music on Indale was a gathering place for all of the local musicians. . . on Saturday afternoon all we lacked was a pot belly stove and a checker board to give it an old time atmosphere. Thanks for putting this up! I sent a link to all of the former BMC employees that I have e-mail addresses for. . . you may hear from more of them. PS I have some STOLEN FROM BRUCE guitar picks also. . . Thanks, David (or DJ). I hope you’re doing well, and still have some crazy nights. Great! Is it still in good working order? I’d like to see that photo when you get it. I’m sorry that I’m no expert on that. An established piano dealer/store should be able to help. I am trying to find out how old my upright piano is. It says Reed & Sons and it has a bench and a mirror in the middle of the piano. I have a Bruce Piano bought around the 60’s. It was a fine piano, cost around $800. The piano company had there names stamped on the pianos “BRUCE”. I bought this piano new from there store in North Miami Beach, Florida. Are you the same company, if so, what company build Bruce pianos. I recently purchased a Mason & Hamlin piano and am trying to find the age of it. I saw the Bruce paino sticker on the front and found this article. So far no luck finding the Serial number. There is a number on the cabinet on the right side but nothing on the base that I can find. The tuner box has the patent date and the established date of 1895. Oddly the international tune is posted as A 435 instead of A 440. So far I have been so thrilled with all of the stories that I have found that are associated with this piano. I look forward to finding out more of its history… If only it could talk. how interesting. For some reason I thought to google Bruce Music this morning. What a surprise to see this pop up. I also remember many Saturdays and a few summers working (or “hanging out”) at the store(s). I loved the player piano room at the Lancaster store! Thanks for your comments. Steinway has a table online showing the age of their pianos by serial numbers: http://www.steinway.com/technical/how_old.shtml . You can contact them for more details about a specific instrument. I’m sure that other manufacturers would have similar records, but they may not be as easily accessible, and some companies have gone out of business. The serial number is usually on the plate, or metal frame, where the strings attach. Thank you for this journey into the past of Bruce Piano Company. I just recently got a Bruce Piano from a friend of mine who was needing space in her room.After reading this, i feel it is an honor to have a piece of history right here from Fort Worth.It is a beautiful spinet, but i will have to look into repairs as it does need some restringing and some tuning.But for the age i would have to say its in very good condition. Is there a way to find out the exact date it was made? Once again Thanks for this information!